So, I’m realizing that there’s something about me and black in quilts. Even when I do baby quilts – they tend to have a little black in them (or a lot). It’s not intentional. I guess that’s just what I’m drawn to. Especially when it is paired with bright rich contrasting colors. Ooooh! 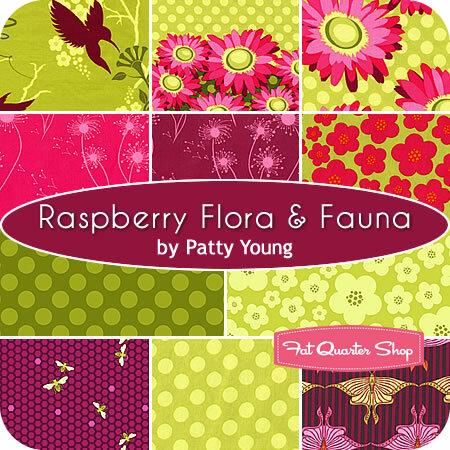 So, I guess that it should be no surprise that as soon as I saw this amazing new line Flora & Fauna from Patty Young (Michael Miller) I knew I had to have it. At the Fat Quarter Shop they say that it should be available in December. Well, it’s December! OK. OK. I’ll stop being impatient. But, I just can’t wait until it comes out. I don’t even know what I’ll do with it yet but, I love everything about it. I know I’ll get at least the Stone palette. But, the others look yummy as well. Just look at the Mustard. . . Oh, and the Raspberry with the green. 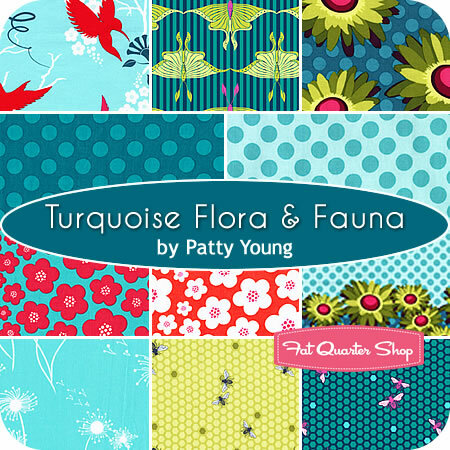 . . even the turquoise is wonderful and delicious! I guess I’ll have to wait. . . 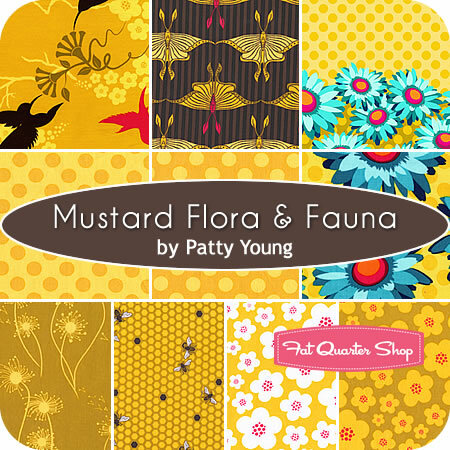 I also visited Patty’s blog MODKID Boutique and found the most wonderful items made from her fabric line. 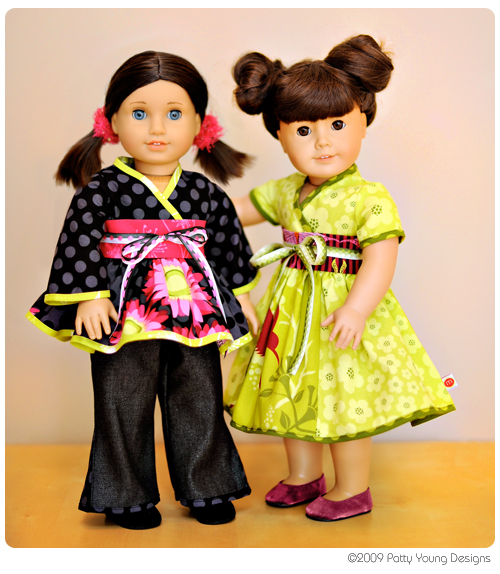 She has some adorable pattens for girl clothes but, if you have a second, take a look at the doll clothes patterns that she has for American Girl dolls. I’m not really into doll clothes but, her patterns are SOOOOOOO cute – they make me want to make some! Oh well, enough cuteness for one day. I guess since I have to wait on these anyway, I’ll just have to be resigned to dream about what quilt I’ll design out of these. . .
I’m excited about that line too! 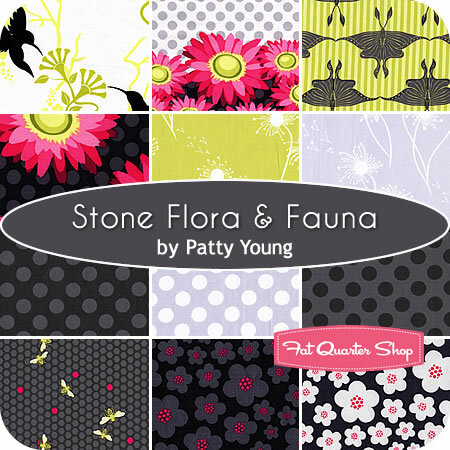 I think Hawthorne Fabrics already has it in if you want to buy some and they have great prices! That’s awesome Kris! Thanks so much for letting me know. Oh, and I love the Jungle Quilt on your blog! Hello Erin, I don’t think I’ve seen the Botany line yet. I’ll have to look it up! What I like so much about Flora & Fauna is that it is so bright and engaging. I LOVE bright and engaging. this flora and fauna is amazing. i gasped, and then giggled. my husband was sitting nearby and saw what i was looking at and shook his head, then told me not to buy anymore fabric. but i can not help it. Ha ha! See, I don’t look at fabric around my boyfriend – let alone respond with joy. 😉 I also go fabric shopping alone. 😉 And sometimes have to sneak the fabric in the house. So, I completely understand!